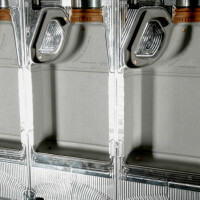 One of our main specializations is creating molds for the packaging industry. 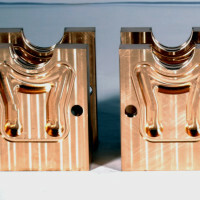 Blow mold manufacturing is best suited for hollow parts that require a consistent thickness. 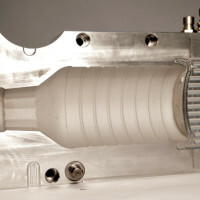 We work within your tolerances to create a final product you can be proud of. 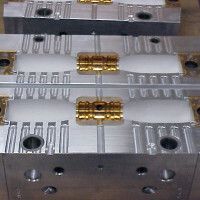 Triple Cavity Shuttle molds allow you to triple the output of a single-sided machine. We construct the mold out of multiple materials so that it suits your specific application. We build custom molds specific to your machine’s requirements. Four Cavity Shuttle molds allow you to quadruple the output of a single-sided machine. We construct the mold out of multiple materials so that it suits your specific application. We build custom molds specific to your machine’s requirements. Our Quad Neck-to-Neck molds are constructed with multiple materials to suit your needs. These molds perfectly align with the pin side to ensure a high quality run. Built with durability in mind, Quad Neck-to Neck molds are perfect for large-scale industrial manufacturing. BeCu (Beryllium Copper) necks are designed to be tough, durable and distribute heat. Precision machined within a +-.001 tolerance to guarantee thread fit. BeCu necks are easily interchangeable for future thread designs. Before large-scale production of your mold set, we can create one-off designs in order to ensure that everything will run smoothly. 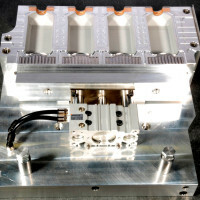 Our unit cavity molds are specifically designed for your machine.